Get endless sparkle with a bridal set from Perfect Fit. This 9ct white gold bridal set comprises of a dazzling princessa style diamond cluster ring with diamond split shoulder detail for extra sparkle. 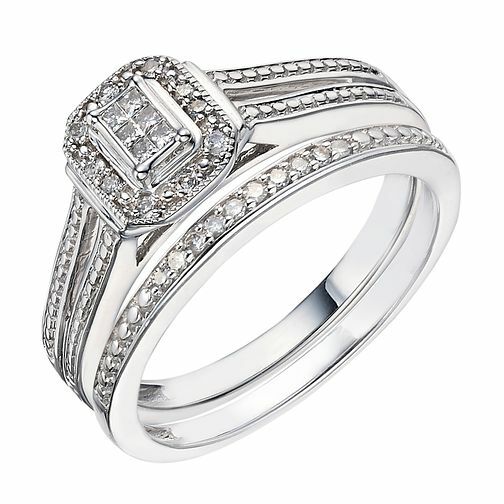 The set is completed with a beautiful channel set diamond wedding band. 9ct White Gold 0.12ct Diamond Perfect Fit Bridal Set is rated 4.7 out of 5 by 6. Rated 4 out of 5 by Anonymous from Value for money The ring did look better in the picture as it seemed a little smaller in real life, however the quality of the ring is decent and for the price I paid, it was worth it.